Sets Up "Hands-Free" in Seconds! TransFold is ready to go wherever your choir performs! 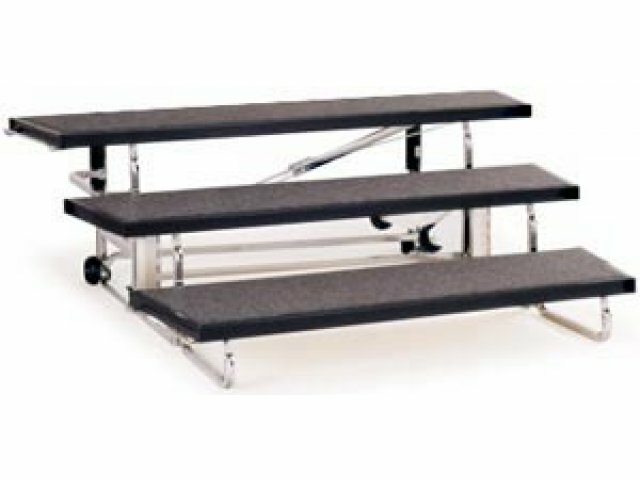 Built-in wheels make it easy to roll each unit from the classroom to the auditorium or up stairways and onto a bus or van. 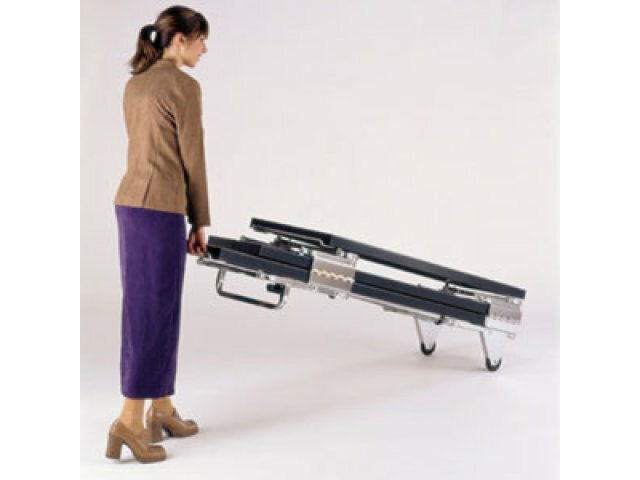 Midwest's exclusive gas-spring assisted designs allows the unit to open with moderate foot pressure-no strain, tools, or hands necessary! 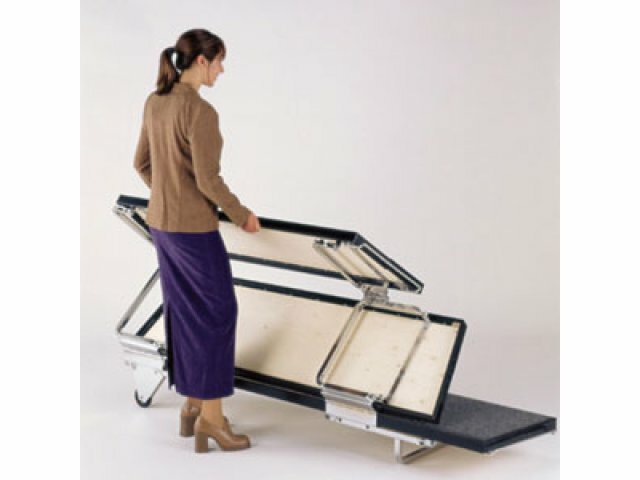 This also ensures a safe, controlled motion when folding the unit for transportation and storage. 100 Lbs. Per Square Ft.
We strongly recommend that Optional Back rails be used for added safety. Each unit has 3 levels, 18" deep and 8", 16" and 24" high that are permanently joined with hinged mechanisms that enable the unit to open and fold in sync. A fourth level, 32" high may be added if needed. 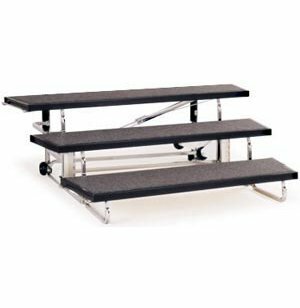 Risers are supported by tubular steel frames of 1" x 1" 16-gauge zinc-plated steel. Individual frame sections are joined with 11-gauge, knuckle-type hinges, secured with Grade 5, 5/16" bolts and locking nuts. 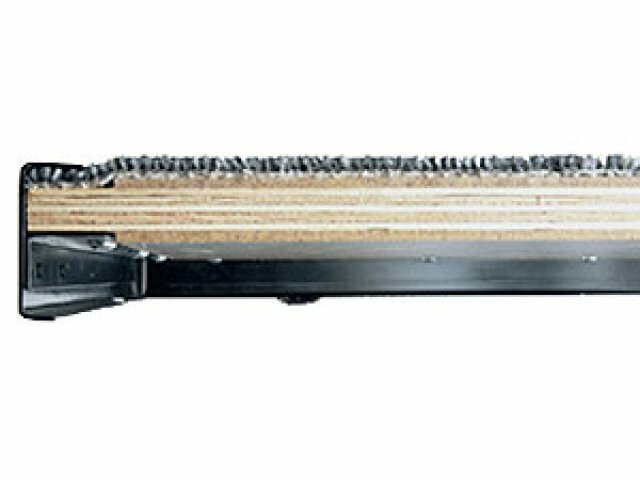 Riser Decks are made from 3/4"-thick plywood, surfaced with polyolefin carpet. 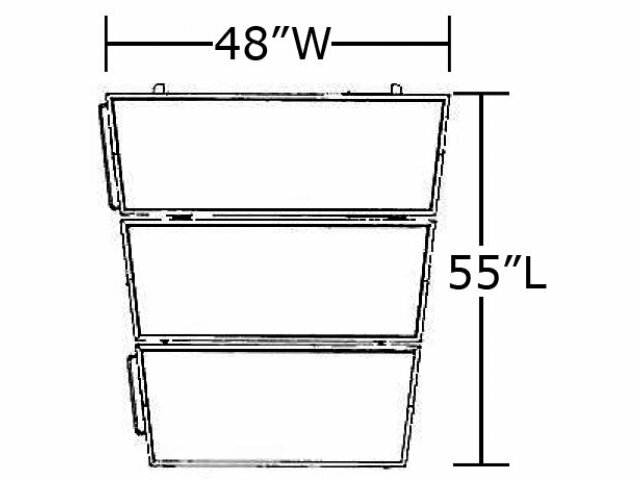 Decks are encased and supported by 1 13/16"-high channels of 16-gauge, powder-coated steel. 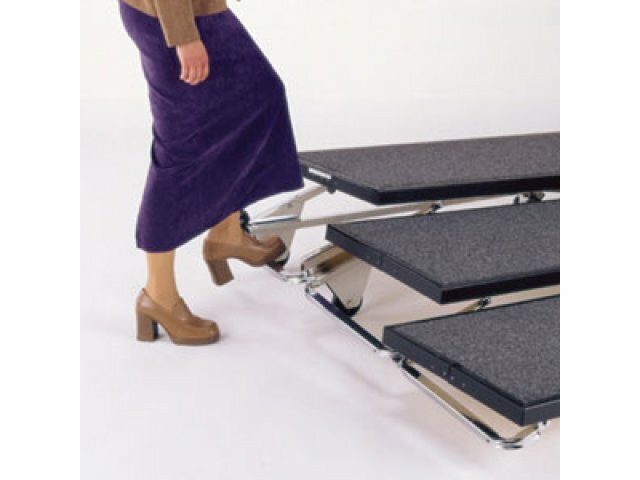 Risers can support 100 lbs per square foot. For added safety, a horizontal force of approx. 48 lbs. is required while operating the lock release to begin folding the unit. Made from zinc-plated 3/8"-diameter round bar. Can be coupled with Wenger Tour Master Risers. Optional back rails are constructed of powder-coated tubular steel with integral clamp-on attachments for easy, tool-free installation.